Tried it and it worked like a charm. No need for static addresses. Thanks for the tutorial, was a little nervous in flashing the router at first but the instructions were short and easy to follow. Nice write-up, but it doesn’t really to make use of my router ip, any advice? Nice post – very helpful. Thanks! I followed your instructions to the letter, all worked well, but how will I know that the bridge is picking up the main router. My main router is a Dir 615 and I can see the Mac addresses of all the computers except the WL-520GL on the Dir-615? This is a great post – everything worked fine. I did find that when dd-wrt first opened in the browser, it prompted me for a username/password. When I used my own creative one, I couldn’t access the configuration pages without a username/password prompt coming up (of which I couldn’t successfully login). Did some reading online … After doing a 30-30-30, I set my username/password again to “root” and “admin” respectfully and had no problems. From my understanding, the WL-520GU already has network bridging features. It is in the web gui. Does it not function satisfactorily? Please advise if I cannot expect it to function as a bridge out of the box (like the literature says it can). excellent writeup, still useful 2 years later. Hello! This is a great post… this is what I need 😉 I will try it after work. 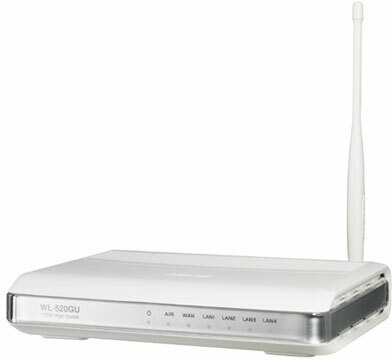 I just have one thing to ask… and by this you will understand how bad I am in this kind of issues =P how should I connect my ASUS 520GU with my main Router (which is a Router Wireless Thomson TG784n from my TV+Phone+NET service), should I plug LAN# in the main Router with WAN in the ASUS? Thanks in advance! The WL-520GU works as a bridge out of the box. (kinda)… I’ve set this up here and if you’re not bridging to another wl-520gu you can only use either Open or WEP. The asus firmware (rev 3.0.1.4) has an okay interface, and bridged just fine for me when I tested with WEP talking to my gateway Billion 7800N. But no-go with WPA … I’m running wpa2-psk, tkip on the rest of the network and don’t want to change that, so right now it looks like dd-wrt (or maybe tomato) is the only option for me. About to flash the wl-520gu with dd-wrt v24 build 14896, cross fingers I don’t brick anything ! I was also not doing 7 when uploading. Thank you for the description, it was very useful for me to set the bridge on my WL-520GU. I have only one problem. I used the USB port for a printer before I changed the firmware, how can I use the USB port again with this DD-WRT firmware? It worked great, I was able to re-purpose my old router to a bridge works great! These instructions worked whereas the instructions on the DD-WRT wiki for setting up a client bridge did not and had me completely frustrated. Also, these are much simpler. Replaced a failed wireless adapter that I had to share between two computers with my old and trusty ASUS router. A great router and now hopefully a great bridge.